This time of year with all the hoopla over graduations there is this palpable feeling of excitement in the air. Everywhere we go this month it’s all about hope. Hope for the future. Sometimes hoping the past stays in the past (you know who you are). Just the lingering feeling of hope. Blah, blah, blah. With all the graduation speeches I have to endure, it brings one thing to my mind: a time machine. 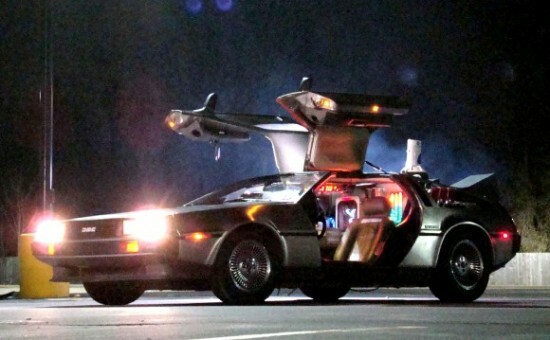 If I had a friend like Doc that showed up with a Delorean time machine I’d jump in and go back to the year 1990. The Corina in the year 1990 was a lot like the 2012 Corina. Except she was a thin little thing fixin’ (a nod to my time spent in Texas) to graduate high school in 1991. I love the English language. Even with all its rules and complexities. If I had it all to do over, I’d study words and communication. I’d immerse myself in language and become a Master Etymologer. And I would make up my own words like Etymologer. But because I’d be a doctor, no one would question it. Everyone would say how clever I am for making up words. I’m pretty sure I’d contribute three new words to the dictionary a year. Just sayin’. I took an Anthropology class last year and one of the topics of discussion was the English language. Namely, how American English is being superseded with Spanish. A lot of class members were under the impression that American English should be the only dialect ever spoken. My view was a little different and very unpopular. Languages die out. They do. None has ever lasted forever, has it? A country is invaded and the conquerors bring in a new tongue. It’s just the way it goes. However, and maybe you historians can help me out with this, has there ever been a language that implodes? With the advent of new technology and modern conveniences, the rising generation (and celebrities) is streamlining our language. Is it a bad thing? Not necessarily. I, for one, could possibly get used to the more efficient “ur” to the pesky choice of “you’re” or “your.” And the whole “their,” “there,” “they’re” dilemma is a bit too much to ask of a person just trying to text. Let’s whittle the choices down to one “their” or better yet, “ther.” Why bother with the silent “e”? Even my spell check is begging me to change the first choice to “there.” It knows what is coming. And trying to figure out if I mean “two,” “too,” or “to.” Let’s just call them all “to” and be done with it. Some would say that the American Language is dying. Is it dying or just evolving? Or should I say, de-evolving? I’ve waxed on about the English language before. Check out Fun with English, Definitions, or a Roze by Any Other Name for similar ponderings. Yes, I think that’s exactly what I’d do with a time machine. That and take a Sports Almanac with me to give to my younger self so that I’d be stinking rich right now. What’s the harm of that?